Daniel Johns has been a musician for the past twenty years. He plays the guitar and the trumpet. Daniel studied at Jacksonville State University (AL) where he attained his B.A. in Music on a full music scholarship. His collegiate ensemble experience includes Chamber Winds, Orchestra, Brass Choir, and various guitar ensembles such as Guitar Quartet and Jazz Band. During this time, he gained valuable teaching experience giving private guitar instruction through the University’s work/study program. He holds his Florida Teaching Certificate in Music Education K-12 and has been working in Duval County Public Schools for nearly a decade. He has taught elementary music appreciation, beginning band, elementary chorus, Orff ensemble, and a wide variety of guitar classes. Daniel has been recording and performing on guitar in Jacksonville for many years. His band has released three albums, and performed at music festivals such as Magnolia Fest in Live Oak, the annual Cleanwater Music Festival held at the Ponte Vedra Concert Hall, OneSpark, Connection Festival, and the First Coast Music Festival. His band has had the opportunity of sharing the stage with national acts such as Days of the New, Thomas Ian Nicholas, 12 Stones, Smile Empty Soul, and Dangermuffin. He also had the honor of sharing the bill with legends such as Chris Robinson (from the Black Crowes), J.J. Grey and Mofro, Emmylou Harris, Less than Jake, and Bonnie Raitt. Other performing experience includes a season of singing with the Jacksonville Symphony Chorus, and playing trumpet alongside members of the Jacksonville Symphony Orchestra in the inaugural Jacksonville Symphony Civic Orchestra. 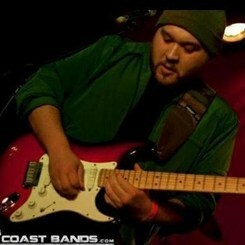 Daniel’s greatest passion is working with musicians and aspiring guitarists one on one or in any small group setting. He has ten years of private guitar instruction with ages ranging from 8-adult. Although he is well versed in many different genres of music ranging from classical to jazz, his greatest musical influences are those that fall into the classic rock genre. His favorite bands are The Beatles, ZZTop, Pink Floyd, AC/DC, and the Jimi Hendrix Experience. Teaching is his “higher calling” and his purpose.